At Uber, we’re hard at work to help you and your family have safe, reliable and comfortable rides. Since we can all agree that our resident furballs are important members of the family, it’s only fair they get a reliable ride around Singapore. So we’re finally introducing uberPET! Starting 20 October 2017, there will be a pet-friendly ride option on the roads of Singapore to offer a comfortable ride for your furry friends. We’ve selected our driver-partners who are willing to accept pets in their cars so you can request a convenient ride for you and your pet at the tap of a button. Rates for uberPET will be the same as our uberX, with a $2 booking fee. But good news! We’re waiving the booking fee until the end of the year. Your uberPET ride will be there within minutes! The $2 booking fee for uberPET will be waived until the end of the year. This means your uberPET rides until Dec 31, 2017 11:59PM will be the same as uberX fares. We expect high demand for uberPET especially over the weekend. If you cannot find an uberPET car nearby at first try please wait a few minutes and try again later. uberPET is finally here! Go on, request an uberPET and take your favourite furball for a pawsitively purrfect day out. What is the fare for uberPET trips? It will be priced the same as uberX, with a $2 booking fee. This fee will be waived until Dec 31, 2017. No promo code is needed for the fee-waiver. What type of animals are allowed on uberPET? Common household pets are allowed on uberPET. This includes dogs, cats, rabbits, turtles, hamsters, birds in cages and fish in bowls or plastic bags. Can more than 1 animal be on board uberPET? uberPET is guaranteed a safe ride for 1 pet. If you have more pets, it will be left to the discretion of the driver to take them on board. Do I need to request an uberPET if I have a guide dog? Guide dogs are allowed on all Uber products. You need not book an uberPET if you are travelling with a guide dog. Does the animal need to be caged? We strongly encourage all riders to ensure their pets are on a leash or kept in their carrier/cage during the trip to ensure the safety of the animals. All animals must be accompanied by a rider on the trip. Who is responsible for the cleaning charges? 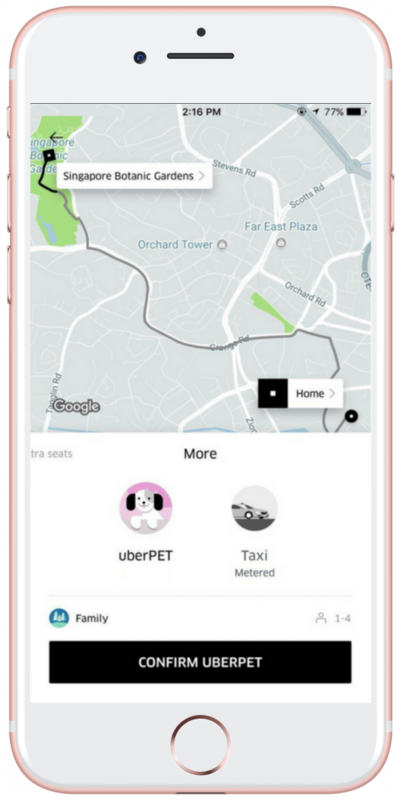 If you choose to use uberPET, the rider is solely responsible for the animal and its behaviour during the entire trip. In the case of incidents, where car cleaning will be necessary (urine, poo, vomit, etc.) and/or any damage caused to vehicles due to the use of uberPET, users must pay for the cleaning fee. Cleaning fee may vary depending on the damage caused. Minor incidents such as fur shedding will not be charged to the user. Is there insurance coverage for the animal on board? Animals are not insured on uberPET rides.